Another tea party this afternoon, with some of Chie's friends this time - but didn't manage to take any pictures while the guests were here! Spent the day in and around the flat, including a while tidying up the garden. In what is possibly becoming a pre-Christmas tradition, like last year we went on a pub crawl in search of festive quaintness. This time all the way out to Oxford. Erika went to the Christmas party at her nursery in the afternoon. In the evening Chie went out, and owing to logistics reasons Erika and I went for dinner at Oliveto. 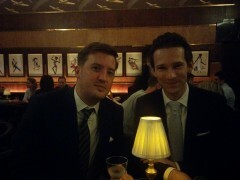 Evening out with Al, Kyle and Andrew in the City - at the Old Wine Shades, followed by the Relais de Venise. Kyle, Hannah and Ralph came round for afternoon tea. Took Erika to the zoo in the morning, then pizza at Rossopomodoro for lunch. Then a visit to my club whilst Erika dozed in the afternoon. Oh, and bought a 100 year old bottle of Madeira. Tried a different Gevrey Chambertin. Drove back from South Wales in the morning, then had a horrible time trying to park the zipcar. Went to the Southampton Arms in the evening. Lovely family gathering at lunchtime at Vera and Robin's house, with Louise, Bec, Dave and Jessica. In the early evening we went to Usk to see the reindeer procession. Decided to drive to South Wales for a change, so picked up a zipcar first thing, and spent the morning driving to South Wales. On the way to Abergavenny we stopped off in Penallt for a viewing of a cottage we were vaguely thinking about buying. 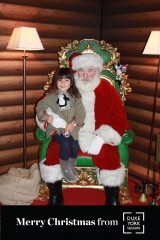 Erika went to visit Santa Claus near Sloane Square at lunchtime, I popped out from work to go with her. Lunch at Wahaca, after which we bought a Christmas tree.